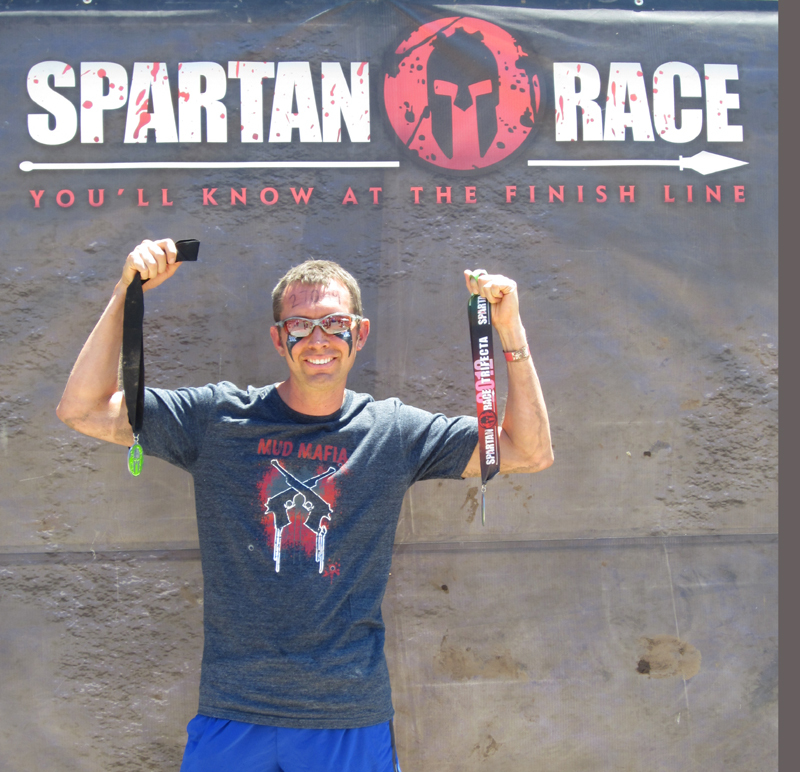 That ‘clink clink clink’ sound heard after the race: That was the sound of satisfaction created by my Beast finisher medal and my Spartan Trifecta medal clanging together. The bruises and scratches on everyone’s legs and arms: Those were inflicted by the barbed wire crawls through the mud that was strewn and littered with jagged rocks. That dusty, rugged mountain range in the background that 2100 people just ran up, around, and down: That was the Wasatch Mountain. Two hours thirty-one minutes and forty-five seconds: That’s the finishing time of someone (me, in case you don’t figure it out) who has virtually no leg or cardio training in two months and who ran the race with a stress reaction in left foot and swollen right knee. By all rights I didn’t have any business competing in this, but it was a Spartan Beast race for crying out loud! That is my favorite race ever. I skipped a couple of warrior dashes, but not this one. I made peace with myself that I was just going to run the race, do what was necessary to not cause further injury, and not worry about how far back I placed. That meant easing way back on the throttle, measuring all steps and landings, and avoiding movements that would compromise my knee. It’s really, really difficult to post a decent time when doing that, but I still finished in the top 25% overall. Given the circumstances, I can live with it. I’m not ecstatic, but I can live with it. The young woman that I raced alongside for the last 3 or 4 miles: That was Margaret Schlacther. Although we’ve conversed online for almost a year, this was the first time we’ve met face to face. It’s also the first time that I’ve ever raced alongside someone and chatted in a competitive event. Like me, Margaret was nowhere near full strength, still fatigued from the Death Race a couple of weeks ago. Talking to her about jobs, horse racing, and of course, obstacle racing, took my mind off my knee, which was extremely irritated by this point in the race. The thousands of Facebook posts and photo uploads: That is what happens when people compete in and finish an awesome race like the Spartan Beast. The three guys I had dinner with after the race: Nathan Page, a Spartan friend from the AZ Super, and Christopher Brill and Jeremy White – 2 great guys that I just met, but had that immediate Spartan bond with. Contrary to popular belief, I did not completely decide to run in the race until the morning of. Granted, I was leaning in that direction for a few days, but I was still concerned about exacerbating my injuries. I drove onto the race site and was directed to a parking spot right next to Chris Rutz, with whom I’ve raced several times. I chatted briefly with him and then made my way to registration and an extended session of stretching. I got in line at the very end because I wasn’t sure what my knee was going to do out of the gate. Fortunately it held up okay, but I had a whole herd of people to get around. It was crowded for the first half mile or so as I weaved in and out of people and went “off road” a couple of times. Utah was dry and I literally know what it means to eat someone else’s (probably about 200 people’s) dust. I hate the first part of races…all races. I don’t know if it’s just me, but I’m jittery and feel out of breath really quickly until I can finally settle into a place and a pace that I’m comfortable with. The start of this one was especially not fun for me. In addition to being in the back of the pack, the initial ascent up the mountain reminded me of my lack of cardio work the past two months. It was a hot, hot day and unlike the Indiana Sprint, I welcomed all the dips in the mud…and there were a lot of them. At about mile 4, the KT tape I had put on my knee prior to the race was destroyed. I didn’t expect it to last the entire race, but I hoped to get more mileage out of it. Around mile 5, I started feeling the swelling and weakness in my knee. That started concerning me because there was a lot of race left and I wasn’t sure what else the course was going to throw at me. Fortunately for me, this Beast was not like the Vermont Beast. The terrain just wasn’t the same and there were horse paths to run in, unlike the Vermont Beast when we just ran through the ramble. 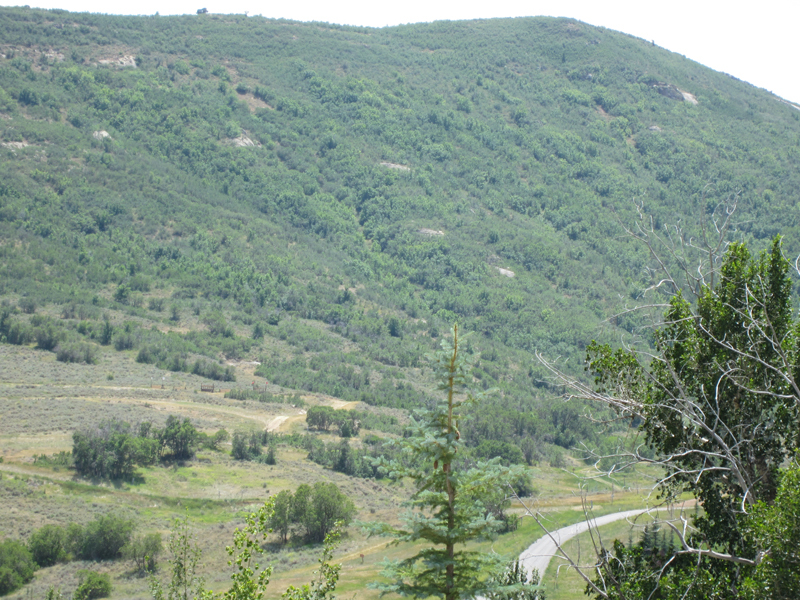 It’s unfair to compare the Utah Beast to the Vermont Beast. The Vermont Beast was just plain grueling in every sense of the word. This Beast had some of the elements, but the lack of long steep ascents through weeds up to your neck and swimming 100 yards across a lake meant that this one was easier…much easier. 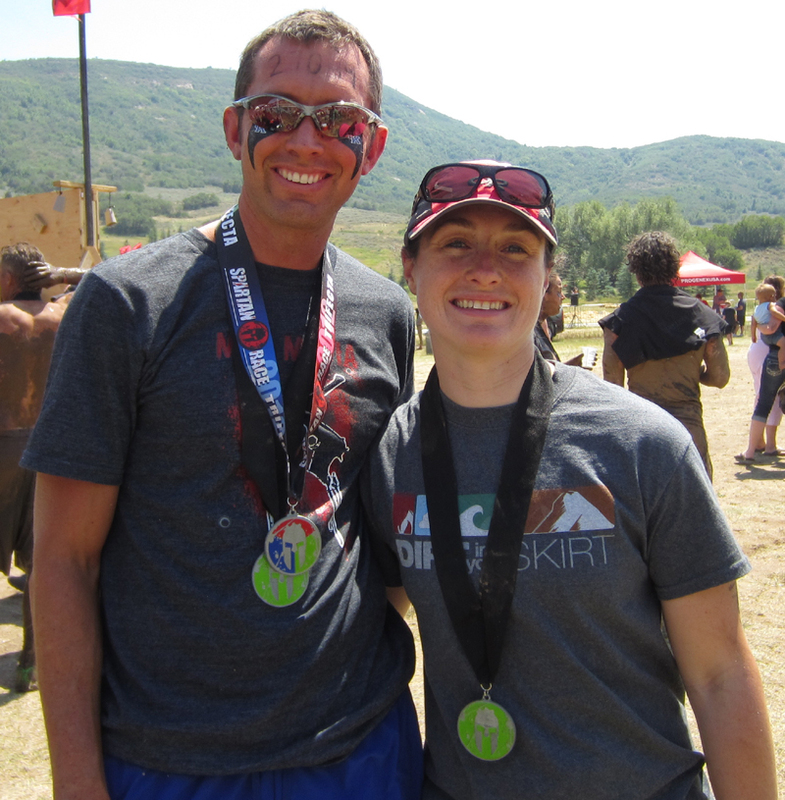 I think there were around 30 obstacles…all the regular walls, rope climbs, cargo nets, mud crawls, barbed wire crawls, gladiators, dragging cinder blocks up a hill, the hercules hoist, etc…. This one also had a sand bag carry and the bucket of rocks carry resurfaced. There were a few new ones that I liked. One involved climbing a cargo net up to an overpass and then pulling a tire up by a rope. The most difficult new one was a tire jump. Not a high-knees tire run, but a “put a strap around your ankles” and hop uphill through about 25 or 3o tires. It was very “tireing”. Sorry, I couldn’t resist that. My favorite obstacle of all, and probably unique to this site was an air rifle target shoot on the Soldier Hollow shooting range. The obstacle involved lying down and shooting a quarter-sized target about 30 yards away. How often do you get to lie down in the middle of a race?! It was awesome! That was a piece of cake because the guns were sighted much better than my own! Right after the target shoot, I stuck the spear throw. That’s 2 for 2 in Beast races and 0 for 3 in all others. I had yet to do a burpee and the last obstacle with a penalty was the horizontal traverse. As I started across it, I thought to myself that I’m going to get through a Beast with no burpees. Yep, you guessed it. About that time, my calves started cramping, one of my feet slipped, and down I went. UGGGHH! 30 burpees. I climbed over a wall and then started the first of two final barbed wire crawls. I was only a few feet in when my calves cramped again and that continued throughout, causing me to stop several times. Finally, I reached the end of the crawls, sped by the gladiators and was finished. When I saw a clock, I couldn’t believe it was only about 2.5 hours. This race was fast. I would love to have another go at it with a healthy knee and foot and proper training leading up to it. Maybe next year. It wasn’t Vermont, but it was still a really good and tough race. I know, because 3 days later I’m still feeling some of the effects. For another account of the race, read Margaret’s, Dirt in Your Skirt blog post about it. For an excellent video glimpse into the race, take a look at my friend, Forest Call’s video that he put together for Margaret. Finally, the race wouldn’t be complete without the dorky flex pose. This time I was reppin’ the Mud Mafia, so it made me look a little cooler. Congrats on the Beast, Jeff. I’m getting really pumped for the upcoming Mid-Atlantic on 8/25. I can’t remember if you’re still thinking about coming to VA for that one. If so, I will look for you. Thx! I’m definitely out for the Mid-Atlantic…will be traveling for a speaking engagement. Hate to miss it. So great to meet you! I was happy to see you run by and to know that your body was holding up. Look forward to seeing you when you come back to Arizona, in February! Jill, it was good to meet you too. I definitely hope to see you in AZ in February. Right now it’s a strong “maybe”, depending on whether or not I want to swap it out for another Super out west. I think the girls and I might be heading to Las Vegas for the Super. Hello, congratulation on the trifecta! 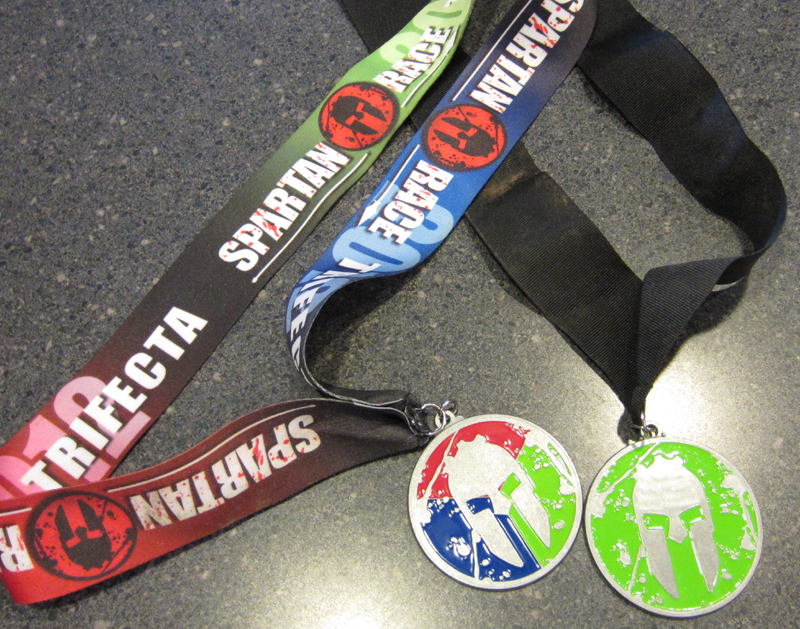 I completed all 3 races in the month of June and was wandering how did you receive the trifecta medal? did you have to apply for it? Congratulations to you too! They had the medal at the Utah Beast for everyone that had completed it. They were at the merchandise tent. ahh , they didn’t have them at the Ottawa beast. Great write up. Makes waiting for September nearly unbearable. And yes that distinctive ‘clink, clink” is motivating to say the least. Well done my friend, well done.